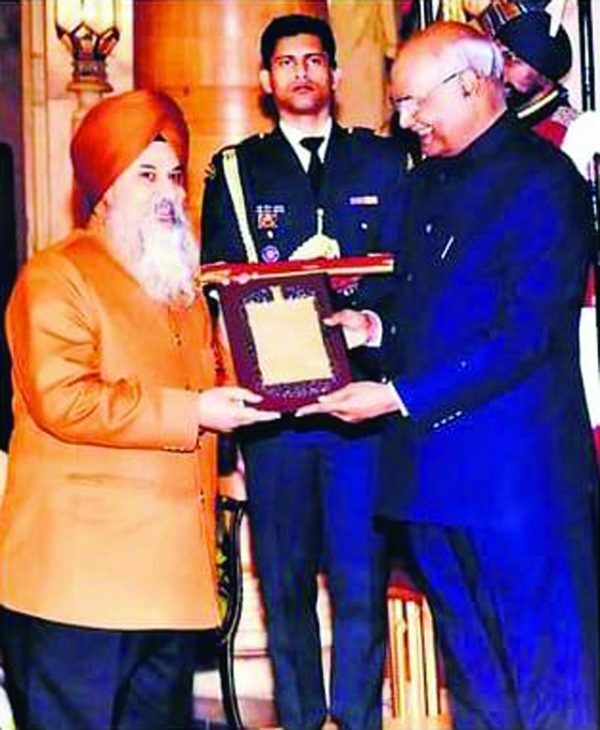 NEW DELHI: First time in the history of Indian music, Gurmat Sangeet was recognized and a prestigious award by Sangeet Natak Academy was conferred upon Dr. Gurnam Singh, founder and Head of the Gurmat Sangeet Department, Punjab University, Patiala, by the President of India. Sangeet Natak Academy was set up by Education Ministry, Government of India, in 1952. The Academy functions as the apex body of the performing arts in the country to preserve and promote the vast cultural heritage of India expressed in Music, Dance and Drama. Past awardees of the academy include famous artists like Pt. Ravi Shankar, Pt. Jasraj, Ustad Rashid Khan, Ustad Bismillah Khan and many others. Dr. Gurnam Singh, who received the award in February 2019, was born into a family of famous Kirtankars. He was introduced to Kirtan by at an early age by his father. Dr. Saheb has written about 18 books and published over 200 research papers published in various journals related to Gurmat Sangeet. He is a kirtankar of eminence and has released numerous recording, including a complete recording of 31 main Raagas of Sri Guru Granth Sahib. Dr. Gurnam Singh’s major contribution, among many, is the revitalization of string instruments like Dilruba, Taus, Siranda and Rabab from the time of Sikh gurus and popularizing them the modern times. He introduced the accompany of a string instrument player at the Darbar Sahib kirtan at Amritsar. Appreciating his work, noted Ghazal singer, Late Shri Jagjit Singh once said, “This very simple person is an authority on Gurmat Sangeet”. They worked on a project, called “Dhur Ki Bani”. Hindustani classical vocalists Singh Bandhu, Surrinder Singh says “with his contributions, Dr. Gurnam Singh has become an institution of music.” In 2002, Dr. Gurnam Singh was honored at the Harvallabh Sangeet Samiti for his contributions to Gurmat Sangeet. Dr. Gurnam Singh’s vision includes, essentially, the dissemination of Gurbani to every corner of world through Gurmat Sangeet. His rendition of 62 raagas and prakars of Sri Guru Granth in his melodious voice is a rare treat to the listeners. Houston Sikh Sangat is very fortunate to host Dr. Gurnam Singh on several occasions. His performances at the Gurudwara Sahib of Southwest Houston several times for the past three years have been very inspiring.